How confident are you in your choice? Would you like to draw another neighborhood? Remove this neighborhood from the map? To kick off this project, we're partnering with Downtown Dallas Inc. as they revisit their Downtown Dallas 360 plan. Downtown Dallas 360 describes the greater Downtown area as a series of 15 Districts, each with unique assets and character. Take a look! Don’t see your neighborhood? Do you think something has changed? Or you simply think this is spot on? Tell us! We want to hear from you. Neighborhoods are the space of our everyday lives. They are geographies that host communities of shared interest and identity. Super neighborhoods are contiguous groupings of neighborhoods or communities that function as an organizing element to help bridge between neighborhoods and larger municipally designated geographies such as service areas or city council districts. 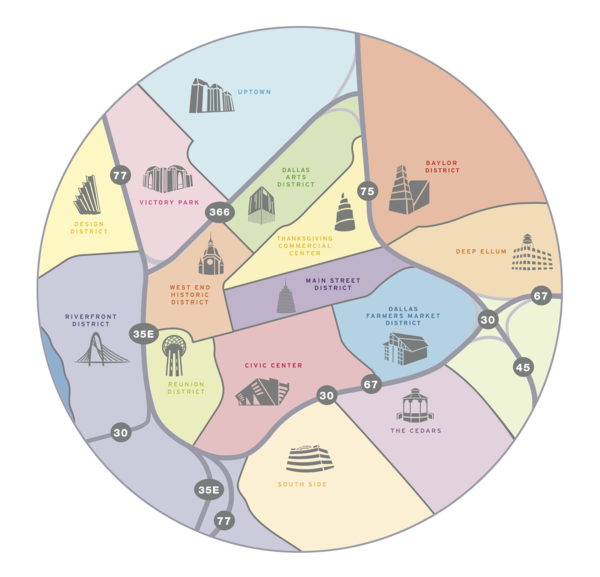 Welcome to the Draw Your Neighborhood map, a participatory map of the city of Dallas. Neighborhoods are the building blocks of a successful city and for us to build a strong city together, we need to start with knowing what all of our neighborhoods are! We think we've got a pretty good idea of what Dallas's neighborhoods are, but we need you to tell us what we got right, what we got wrong, and what we missed. Participating is easy! For more information on the crowd sourced neighborhood map, click here. Otherwise, click "next" to learn a little more about drawing the neighborhood boundaries. Thanks for sharing your knowledge and love for Dallas!